The self-study version of our exclusive marketing intensive, created to help you confidently attract more of the right clients to your design business. is now closed. But don't worry! You can get in the next time bootcamp opens! Make sure to leave your contact info below and I’ll update you when registration opens again. You’ll also get blog posts delivered direct to your email + occasional offers. 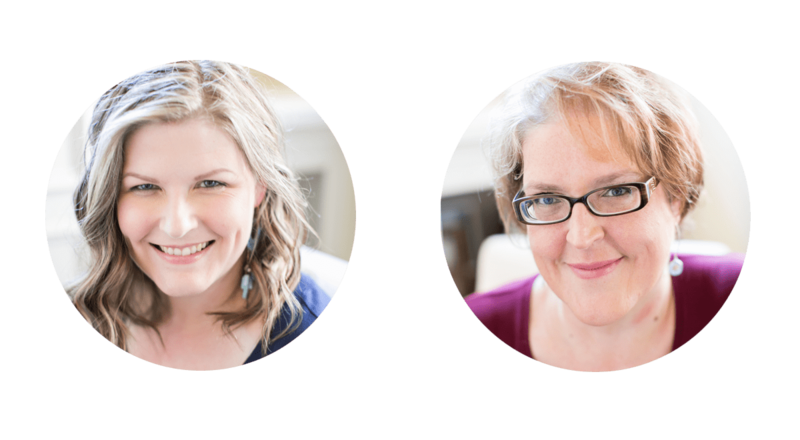 What could you accomplish with an experienced designer (Christine) and a skilled marketing strategist (Michelle) sharing insight, holding you accountable, and helping you apply what you learn directly to your business? This beta version is self-study, but it’s not a course you’ll consume and apply on your own. Designing Success Bootcamp Self Study is an experience, created to push your business forward as you take massive action within a supportive community of fellow students and entrepreneurs. We transform your business one area at a time by applying the concepts of the course to your business through discussion inside the FB community, building momentum together as we go. Each lesson begins with a video + action steps to get you started. Then we discuss the concepts together in our private Facebook group. Once per month, you’re invited to join us for a LIVE STRATEGY SESSIONS where we answer questions so you can apply the theory directly to YOUR BUSINESS. You’ll make changes and take action as we go… so you can see results immediately. Align your business with your strengths and how you fascinate, and craft core messaging that resonates with your best clients and brings them directly to your business. During this lesson, you’ll clarify your messaging, craft your red rope policy, and properly position yourself for success. Use the positioning and core messaging developed in lesson one to refine the branding and flow of your website. During this lesson, you’ll use branding, site flow, and your portfolio to support your core messaging and positioning. Chart a profitable course for your business by refining how you package, price, and sell your work. During this lesson, you’ll use our best practices to set goals in three key areas that influence profitability and take action so you can achieve results. Talk about your business in a way that creates curiosity, engagement, and trust. During this lesson, you’ll map out the unique marketing conversation for your business and learn how to use it effectively any situation or setting. Tell the story of your business, attract attention from your potential clients without wasting time or burning out, and create a marketing engine specifically designed to drive your success. During this lesson, you’ll select and master your ideal marketing channel. Solidify your sales process so you can convert the leads you generate into real, paying clients. Simplify your proposals and eliminate those awkward SALES moments from your process. During this lesson, you will elevate your operations to support your growing business. Get on the waitlist today. The beta round of Designing Success Bootcamp Self-Study begins soon. Are you ready to step up your marketing game? Get on the list to be notified when this special beta round of DSB opens. You'll be able to join DSB for 12 payments of $195 or a single payment of $2000. No refunds are given after the three (3) day refund period following sale for any reason. This is not a month-to-month membership, but a course, and you are required to make all payments. © Designing to Delight 2019.